I have been using this every single day since I got it. I am absolutely utterly in love with it. It gives you the most natural finish which looks invisible to the human eye. Don't ask me how it's possible, but it's possible. It looks like my skin but better, you can't tell I'm wearing makeup at all. This is definitely holy grail for me. It knocks off my beloved Bobbi Brown moisture rich and Bourjois 10hr sleep effect out of the scene. There's one major reason why I love this and that is because it sets. The fact that it sets helps it last all day, I don't even always set it with powder and it still lasts. It's also supposed to be transfer resistant and water resistant = Fabulous! 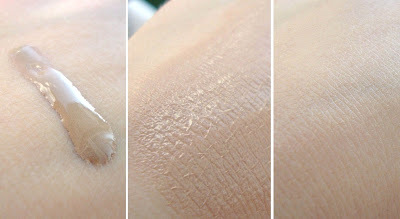 Water based foundations are great for combo/oily skin as it moisturizes without upsetting the oil balance of your skin. It's also great for people with dry and normal skin as it provides hydration... win win situation! The consistency is very watery and runny.. I apply this with my hands, it takes about 10 seconds to set. I have tried brushes but found the brushes absorb too much product and I get a more natural finish with my hands, plus it's faster. If I need extra coverage on my left cheek for example, I apply another layer which works great or I just use concealer. I would recommend this to people who like tinted moisturizers, light foundations and a luminous dewy finish. (Skip this if you are into a matte finish with full coverage.) This will suit all ages and there is a wide colour range to suit all races. I am a shade C4 (NC35) for reference. However, like I mentioned in my haul post, it's so sheer that if you got a shade too light or too dark it will not be noticeable. I have had a few messages from people telling me this expires quite quickly, I'm not too sure what the time limit is... but I'm sure I will finish this way before it goes off as I use it every day. Price: £23 - 120ml. Bargain! 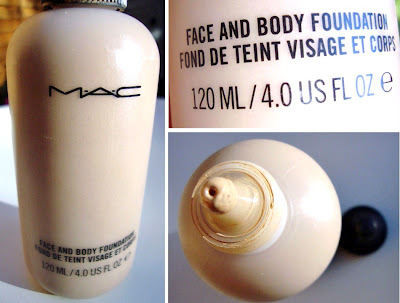 This is my favorite MAC foundation! Everything else breaks me out within a day! I heard about this from lollipop26. Often with foundations like this it cakes on me, even on my oily skin. If I was to apply another layer, would it cake? @Meowcake It no way cakes, I use my fingers so it warms up the product and blends seamlessly into the skin. I would recommend setting it with a powder for oily skin. I bought this a few weeks ago for my holidays as I wanted something light for when it's hot. I usually wear a much heavier coverage foundation but I'm very happy with it, just have to slap a bit of concealer on the bits that need it. I was surprised how well it sets and lasts, much longer than I thought it would. I've been umming and ahhing about buying this for a while, purely because of its coverage - I do prefer a fuller coverage so I don't know whether to purchase or not! I MUST try this out! First lollipop26 raves about this and now you! It looks fabulous! ive been hearing such good reviews about this foundation so this is def going to be my next purchase! I am so sold. Never tried a mac foundation so I can't wait to get this!! I love this too, fab review. My review is up on my blog too. i've been really intrigued by this but i'm not sure it's enough coverage for me. i'll definitely give it a spin, though! my current HG (can't be that HG if it's only "curren" is it? :p) is chanel vitalumiere. it just gives such an amazing glow to the skin and it feels absolutely fabulous! This is a surprising post to me as I heard that MAC foundations tend to focus on coverage while not caring much about a healthy skin condition (= suitable for spot-light usage only). I will have a further look at this foundation! Tried it several times about a month ot two ago and not liked it that much. I found it to be too sticky even after let it to set a while. On the other hand, I really liked the buildable coverage you can get with it. I am not into full coverage at all, I am not wearing a foundation at all most of the time. However I have not noticed any difference with MAC Face and Body foundation on. I looked quite oily with it, to be honest. I definitely need to check this out now! Great review! Great review! I've been wanting to try this and now I want to try it even more! I have a serious phobia of cakey foundation so I love that this is cake-free LOL! I definitely need to check this out now, all these rave reviews are making it impossible not to !! I want to try it. I have combination and sensitive skin. Have you tried MUFE face and Body foundation? Which do you think is better? Is it recommended for those who have combination or oily skin? I did! I found BB Creams! Not sure if you've heard of them but they're a huge Asian craze! I've been wanting to try MAC's foundation for awhile due to some blemishes on my forehead but I'm afraid to since MAC Mineral skinfinish powder caused horrible acne =( Has it caused your skin to break out at all?? great review ! i really want to get it ,, and it looks great on u in the pics ,, as u said it photographs well <3 love it . i found your blog 2 days ago, and just finished reading it all the way through. needless to say im loving it. you are writing about the exact products and brands i use and am interested in and although our styles are completele opposites from each other, i find this blog so inspiring and interesting. on top of that you seem like such a sweet person that i just want to squeeze your cheeks and hug you! 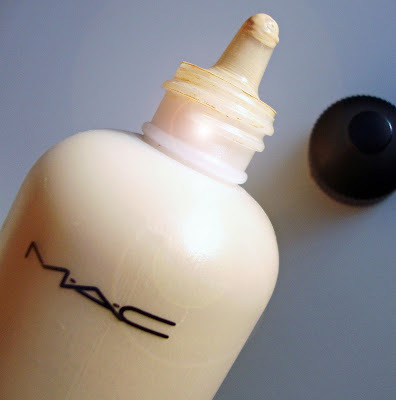 Unfortunately this foundation does not come pale enough for anyone who is NC/NW15, you will need to buy the whote version from MAC Pro and mix your own. Other than that, it is a really nice foundation. but reading such a good review has eased me especially as it is a nifty £23 and that's a lot to me haha! @Sam Yes, this focuses more on skin as opposed to coverage, I have never tried any other mac foundation. @Yarisse everybodys skin type is different, you should set it with a sheer powder to help. @Schnelle Couture yes it does, it takes away redness and smoothes everything out :) well for me anyway. @Sabina lucky you, nars sheer glow was terrible on me. @❤ilvoeshopping❤ I havent tried mufes one, as this is water based infact any water based foundation should workd for oily combo skin. But, you may need to set it with powder on your t zone. Wow this is a great bargain. It is cheaper than the studio fix fluid. I've been meaning to try this for some time now. I think it would be a good change for me as someone who typically goes for a heavier more matte foundation. Its appealing because it comes in neutral shades and at such a large size for a low price. I've heard so many great things! Hi Muhsine! I love your review. I've just started using MAC F&B and it's the only fndtn I can use right now that won't break me out. However, I'm oily, so I do need a setting powder. MAC Blot and Laura Mercier broke me out, so I was wondering if you had any suggestions. I also can't wait to try your MAC concealer rec's. Thanks so much! HI your skin looks AMAZING. you look like frigging supermodel, for real. i was wondering whether if i should bobbi brown's skin foudnation or this MAC F&B foundation, which one should i get? I LOVE using this product on my legs and arms, covers every small imperfection. Not a huge fan of in on my face, it just slides off! Boo! Hi there. Nice blog. You have shared useful information. Keep up the good work! This blog is really interesting and gives good details. autoclave sterilization, baby care products. You look beautiful. Thank you for your review! It seems it would perfectly suit to my dry skin. You look beautiful! Thanks a lot for your review. It seems it would perfectly suit the dry skin. This is really attention-grabbing, You're an excessively skilled blogger. I've joined your feed and sit up for looking for extra of your excellent post.